Philadelphia 76ers have had a horror start to the NBA playoffs with Ben Simmons going to war with his own fans but it was a better Sunday for his fellow Australians Andrew Bogut and Patty Mills. 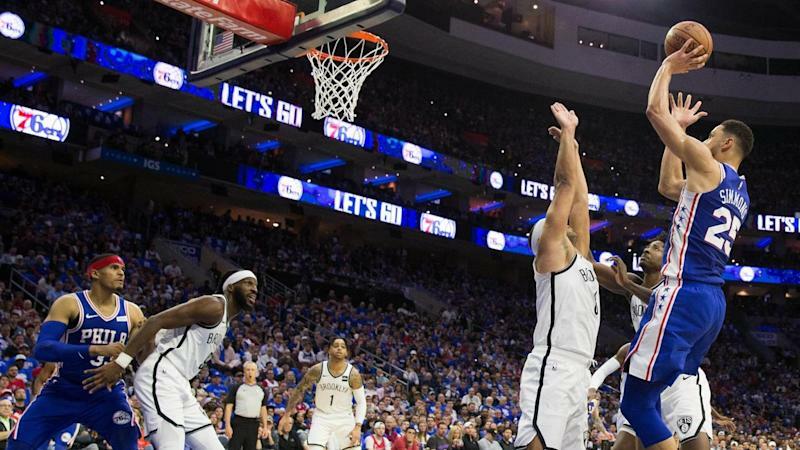 Brooklyn Nets, not given much of a chance of winning Saturday's game one of the best-of-seven eastern conference first-round series at the 76ers, took an early commanding lead and won 111-102. Veterans Bogut and Mills did what was required of them off the bench in game one wins for Golden State Warriors and San Antonio Spurs respectively. Bogut scored three points in just two minutes of court time as Stephen Curry's 38 points led the champion Warriors past the Los Angeles Clippers 121-104. Mills made two big baskets in the fourth quarter in the Spurs' tense 101-96 win at the No.2 seeded Denver Nuggets. The Nets were led by D'Angelo Russell's 26 points and bench players Caris LeVert adding 23 points, Spencer Dinwiddie 18 points and Ed Davis with 12 points. Sixers coach Brett Brown expects Simmons to bounce back on Monday. "I take full responsibility and will accept the consequences of my actions," Johnson said. In Oakland, Curry made eight three-pointers to give him the post-season record with 386 - one more than Ray Allen - and he also had a post-season high 15 rebounds. Golden State's Kevin Durant and Clippers guard Patrick Beverley were ejected with 4:41min to play after they received double-technicals. The Nuggets coughed up the ball twice in their final three possessions as the experience of the Spurs paid off in Denver. D.J. Augustin scored 25 points as the Orlando Magic stunned the Toronto Raptors 104-101 in game one of their eastern conference first-round series.